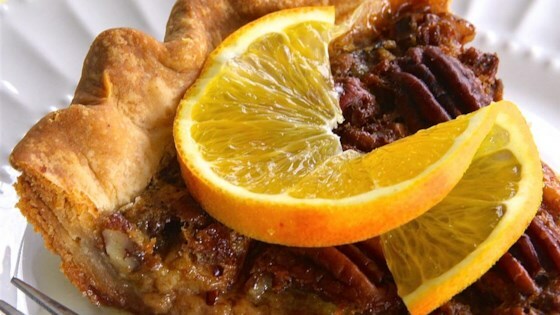 "Pecan pie with a bright orange flavor!" Preheat oven to 350 degrees F (175 degrees C). Press prepared pie crust into a pie plate. Beat corn syrup, pecans, eggs, butter, sugar, orange juice, orange zest, and salt together in a bowl; pour into the pie crust. Bake until pie filling is set in the center, about 45 minutes. Followed the recipe to the letter, but had a little difficulty with the filling setting even after 60 minutes baking. It was just a little runny, but the flavor was spot on!